I wrote the blog below on Sunday, November 29th, 2009. Today I found how relevant that blog is to my life in more than one way. I am getting ready for a trip to my hometown of Buenos Aires. I decided I might want to take a couple of dress shirts. One reason is that I will be going to Mass with my 92 year-old first cousin/godmother this coming Sunday. We will be going to her nearby church, the iconic La Redonda mentioned in the November 29, 2009 blog. Rosemary and I went to the Bay to see if we could find a couple of button down shirts. My good, iron free one is frayed at the sleeves. To my horror they had only two kinds of button-downs. The collars on them were not the classic ones but much smaller. Why is there a dearth of button-downs in Vancouver? Are they that conservative? This means I will have to take a couple of regular shirts. But the collar stays (ballenitas or little whale bones in Argentine Spanish) have all been lost in numerous washing machines washes. So I had to enquire if they sold these ballenitas. Happily they did! This time in Buenos Aires I aim to buy myself a nice new copy of Ernesto Sábatos Sobre Héroes y Tumbas. I have never owned one since I read it so many years ago in Buenos Aires. ¿Cuándo empezó esto que ahora va a terminar con mi asesinato? Argentina is lucky in having more than one definitive Argentine novel. My favourite is Ernesto Sábato's Sobre Héroes y Tumbas , 1961 (On Heroes and Tombs, 1961) which I read in 1964. It left me shattered with its beauty and melancholy. By 1964 the section Informe Sobre Ciegos (Report on the Blind) was famous in all Argentina. This chapter of the novel almost stands alone because of its independence and starkness. It has something to do with a secret society that involves the blind beggars who sell stuff (in my day little ballenitas or plastic stiffeners for dress shirt collars) in Buenos Aires subways and trains. It is staged in a fantastic underworld that coexists with the "real and normal" world. It was in 1965 when I first heard Astor Piazzolla live at the Teatro Florida and fell in love with Susy. I then bought every record of Piazzolla's that I could get my hands on. 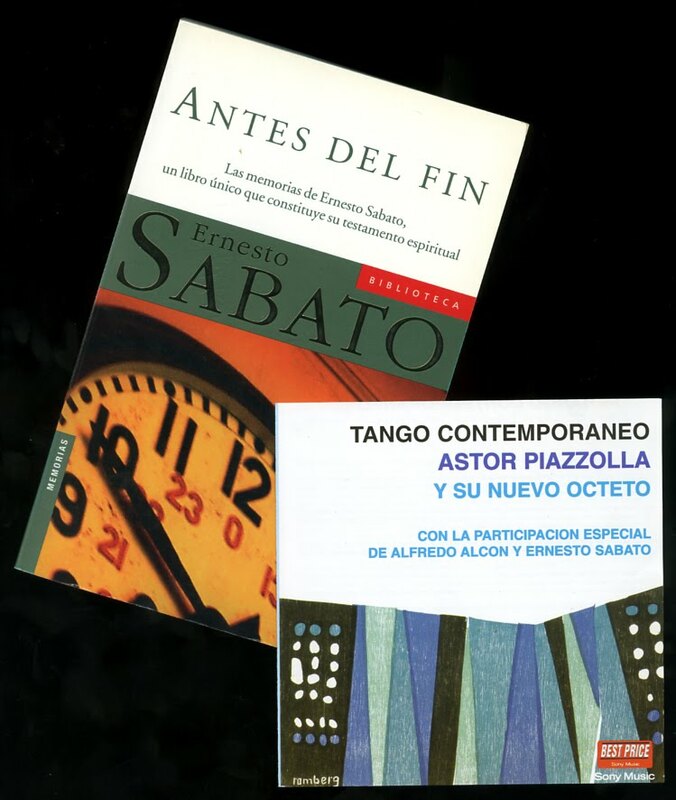 My favourite has always been Tango Contemporáneo - Astor Piazzolla y Su Nuevo Octeto. It was in this recording that I heard Ernesto Sábato himself read that first incredible paragraph from El Informe de los Ciegos. His voice is strangely pitched and eerily monotone. I replaced the virtually unplayable record with a CD just a few years ago. Even today is sounds avant-garde and fresh. Oh gods of the night! When did this begin which will end with my assassination? You can listen to Ernesto Sábato read that if you wait (be patient!) until the end of this striking composition by Astor Piazzolla here. Why is Rebecca's photograph here? 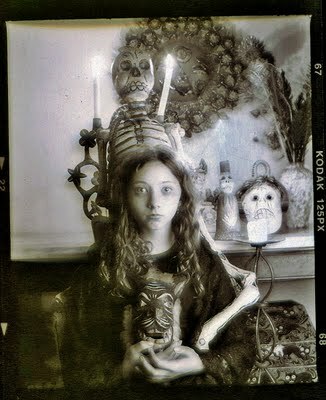 The moody look of the picture with all the skulls and the candles simply brought to mind this book and also of one of the last books that Sábato may have written (he is alive and 98) Antes Del Fin (Before the End) which is an extremely depressing, but wonderful work of essays on death and the author's reminiscences on his life. The melancholy of the rainy and dark afternoon as I took Rebecca's picture also reminded me of late wintery afternoons in Buenos Aires with my friend Felipe Occhiuzzi. We would sit down on a bench at Parque Lezama and try to imagine two men, one with glasses the other a blind man with a cane, walking, slowly, arm in arm, chatting about novels and writing. 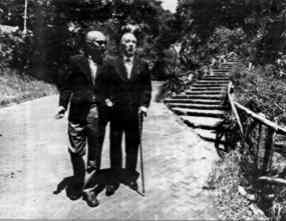 The one with the glasses would have been Sábato and the blind man with the cane, Borges.